At Sequoia Kung Fu & Yoga we practice "Peace-time" martial arts. We do not train for competitions, fighting, or to use aggression. Our practice focuses on self development, and the protection of ourselves and loved ones. In accordance with traditional kung fu practice, we do not assign ranks or award belts. Students are honored and awarded after completing a part of our established curriculum. Our awards recognize the effort and time a student has put in, not a level of achievement or progress to reach an external goal. ​At our school we focus on community. In our community cooperation is more important than competition, character is more important than skill, principles are more important than aesthetics, and function is more important than form. The Kung Fu class taught at Sequoia Kung Fu is made up of the traditional styles of Praying Mantis, Long Fist, Ba Gua, Xing Yi, and Shuai Jiao. Each style adds something unique and useful to our practice. 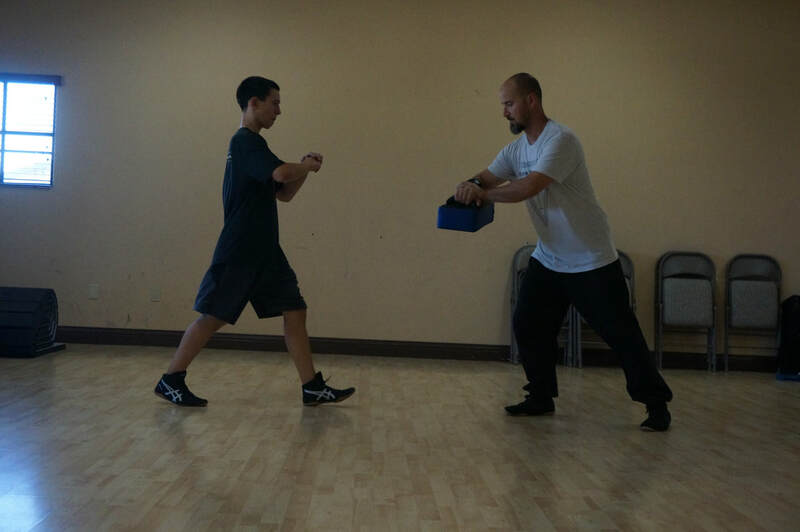 The fast trapping hands of Praying Mantis, the powerful stances of long fist, the quick footwork and spiraling movements of Ba Gua, the explosive power of Xing Yi, and the throwing techniques of Shuai Jiao all add depth to our abilities and gives us a well-rounded skill set. Open to students ages 10 to adult. Focuses on the throwing arts of Shuai Jiao for those interested in developing their stand up wrestling skills and/or compete in Chinese Wrestling competitions. A more traditional and individual format for learning. Individual and small group instruction geared towards the goals and needs of the student. New Students may begin classes at anytime. Please arrive to class at least 5 minutes before scheduled class time. ​All students are required to wear a simple uniform consisting of kung fu pants, shoes, and a school shirt.